Coffee was a part of my regular routine in high school. Upon rolling out of bed, I would drearily meander my way downstairs towards the coffee pot. Although my motor skills are not fully activated during these wee hours of the morning, they’re good enough to pour the grinds into the pot, add some water, and plug in the machine. Within minutes, I am enjoying a freshly brewed cup of joe and ready to conquer the day. But morning isn’t the only time when I need caffeine; at around lunchtime, it’s back to the pot again, or maybe Dunkin Donuts or Starbucks. And if I’ve got three blog posts to write before tomorrow? Tonight you may find me in the mini-mart purchasing a Starbucks Double Energy Iced Coffee. Or maybe worse: a full-blown Monster Energy Drink. It’s nights like these when I begin to wonder: how much caffeine can I have before it’s detrimental to my health? Is one cup of coffee a day OK? Will I begin to have high blood pressure if I have too much? Let’s take a look at the research. According to ConsumerReports, approximately 90% of consumers 18 years and older drink caffeinated beverages daily (ConsumerReports.org). The first thing that comes to my mind when I hear this statistic is: “Well, if everyone’s doing it, and I haven’t seen anyone drop dead because of it, I should be fine.” Perhaps caffeine has a more minute, covert effect on human health. While consumption of the drug may not be a habit that can induce paralysis, doctors typically tell patients to limit their use as much as possible. So we know that it has potential for harm, but how exactly? The Mayo Clinic recommends having no more than 400 milligrams of caffeine per day for healthy adults, and up to 100 milligrams per day for healthy adolescents. Livestrong.com says that 200 milligrams is a safe dose. While the numbers may vary, the organizations report that that health issues typically arise when consuming roughly 500-600 milligrams of caffeine per day. Negative side effects include nervousness, restlessness, irritability, and fast heartbeat–all of which I have personally experienced from caffeine consumption. So what are the long-term effects of caffeine consumption? Another article from Livestrong.com claims a few long term ailments. The first is dehydration; caffeine is a well-known diuretic, drawing out water by increasing urination. In effect, the consumer suffers from decreased organ functionality and ultimately a lack of energy. Another side effect, one I initially believed, is augmented blood pressure levels. Other putative complications may include peptic ulcer irritation and depression, according to the same article. While there are certainly links between the mood variations caused by intermittent caffeine consumption, there is no clear mechanism which provides evidence that caffeine consumption causes depression. It is certainly possible, but more longitudinal studies need to be done in order to better understand this matter. I have not really come to a clear decision regarding the long-term effects of caffeine consumption, but I still learned a few valuable lessons. I now know to limit myself to roughly 400 milligrams of caffeine per day. I did some research and found that a ‘normal’ cup of coffee (with no added fancy stuff) contains roughly 90-200 milligrams of caffeine, so one cup a day should be OK according to these parameters. I personally believe that more research needs to be done in order to better understand the long-term effects of caffeine consumption, but I don’t think that we should assume that caffeine has no long-term effects. There is a well-known Greek saying: Meden Agan, meaning “Nothing in excess.” I think it is fair to say they were talking about beverages too. This entry was posted in Uncategorized on September 15, 2016 by Alexander Nicholas Cautela. As a caffeine enthusiast, I find it hard to complete my daily tasks without 2-3 cups of coffee. I first started drinking coffee in high school. At the beginning of my coffee days, my heart would race at a mile a minute and I would shake to no end. Now, I’m pretty much used to it and it doesn’t have the same effect. I did notice however, that I would experience withdrawals, like frequent headaches, if I didn’t get my expected daily amount. 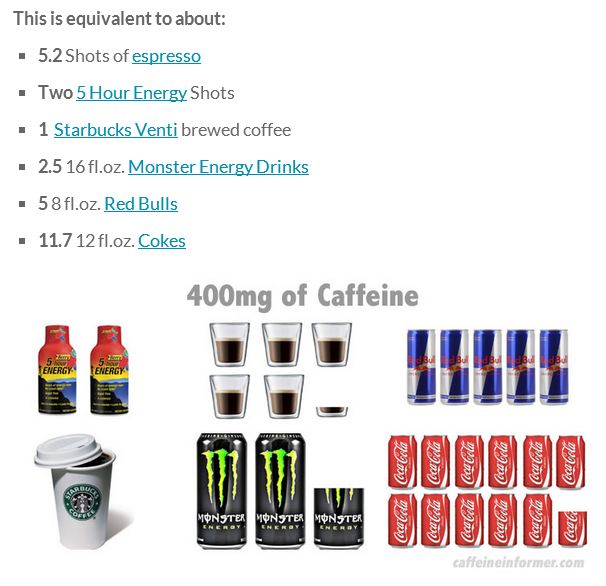 This post definitely changed my perception of caffeine intake. I came across an article that discusses the correlation between Parkinson’s Disease and coffee consumption. It reminds me of the discussion we had in class today about smoking reducing the risk of PD. 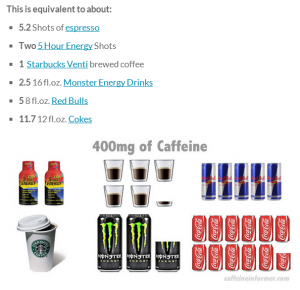 This blog was very informative now I know what is a healthy amount of caffeine to intake in a day. I find myself drinking too much caffeine to get through some days too whether it be coffee, soda, or energy drinks. I realize now that this isn’t good and I need to pay attention to my daily intake. This is a really good informative blog, and I value it so much for the image appended to the bottom. I never really paid attention to the parameters of how much caffeine that one can consume on a daily basis and still be considered alright. What I find most interesting is that some energy drinks will advise consumers not to drink more than 3 energy drinks a day. However, the photo says that I can consume 5 red bulls and still be under the limit. I believe that it is because 5 red bulls will equate to about 2.5 monsters. It is beyond me that Monster Energy can sell a thing that is called a “BFC” and I will not get into the vulgarity of the meaning. There has been such an advance in caffeinated drinks over the years though. There is so much more than just coffee anymore. Hi Alexander! I loved reading your blog because I happen to be OBSESSED with coffee and drink it probably more than I should. All throughout my life, I loved the taste of coffee. I would take sips of my moms coffee whenever she would let me and eat coffee flavored ice cream regularly. Once I got my license, I was free to buy coffee whenever I wanted. In high school, I drank coffee simply because I loved the taste. Now that I am in college and drowning in work, I find that I am drinking a lot more than I used to. I usually purchase two coffees a day, most likely exceeding the 400 milligrams that you stated was healthy. This blog has inspired me to research a little more into how much coffee is acceptable for your body. Further, I came across an article that proposes 2-3 cups of coffee a day is healthy for you. Here is an attachment to the article Here is an attachment to the article.Thanks for the helpful knowledge! I never started drinking coffee regularly until I got to college. Now, I find myself having two or three cups a day! Usually I was never able to drink it because it made me feel sick, but now I feel as if I need the extra boost. I have always been a fan of Coca-Cola however, and I never knew that one cup of coffee was the equivalent to eleven and a half cans! That is absolutely crazy. This article kinda reminded me of the hamster experiment we looked at in class, even though I can’t necessarily see how coffee could affect all these different functions in my body, it definitely will not hurt me to cut down! Great post! As not a heavy coffee or soda drinker, I’ve never had much concern on my amount of intake of caffeine but when I do drink it I get really jittery and strung out and am basically the most annoying person you’ll ever meet for about 3 hours. Whenever my body reacts to caffeine that way even if it is just caffeinated tea, I always think if i feel this way just from one cup of a caffeinated drink, how in the world do people drink caffeinated beverages all day everyday? I know I certainly could not stand to feel so jittery all day long. Maybe it is one of those things like Andrew said in class today that pose a threat to our lifespan and will shave off years of our life but we simply do not realize it yet. Interesting to think about. I absolutely loved this article because I am an avid coffee drinker! I work at Dunkin Donuts back in my hometown and since I am able to get free coffee, I definitely take advantage of that! I am also a night owl like you! I love to stay up all night and because of that I need to drink caffeinated beverages. I know that an excessive amount of caffeine does have horrible effects on the body and I usually do not listen when people tell me I need to stop drinking coffee, however after reading this I will definitely be lowering my intake of caffeine.